A warm, cozy room is the perfect setting for a romantic Valentine’s date. The thing is, Valentine’s Day is in the middle of winter, when it’s likely to be as low as 23° F in our area. The good news? You can stay warm without spending an arm and a leg on your heating bill. Besides the obvious benefit of privacy, closing your curtains and drapes can reduce your energy bill and keep your room warm. You see, according to Energy.gov, about 30% of a home’s heating energy is lost through windows. The good news is, most normal drapes can reduce heat loss from a warm room by 10% when they’re closed. When your room isn’t losing heat, your furnace doesn’t have to work as hard to keep your room warm, which means it will use less energy and you’ll save a little money. Blankets won’t do anything to heat up your home, but they’ll keep you and your significant other warm. Which means, you can lower your thermostat a few degrees to save some money. Plus, sharing a blanket is essential for proper snuggling. 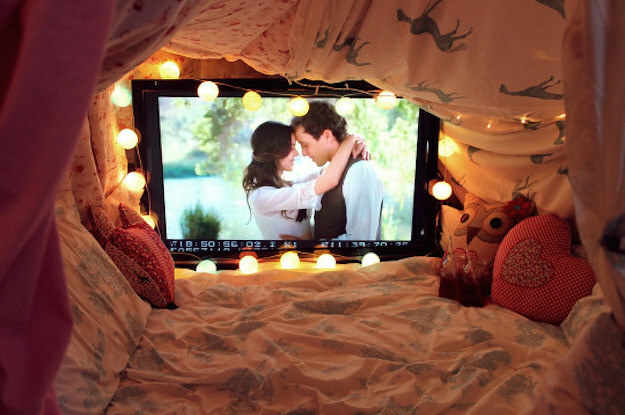 And have you ever heard of a blanket fort? If you have it set to its “summer” (counterclockwise) setting, then the answer is yes. But if your fan blades are set to run in reverse (clockwise) at a low speed, you’ll actually feel warmer. Here’s why: When a ceiling fan is running in reverse on a low setting, it gently draws air up towards the ceiling. As the fan pulls up air, it pushes warm air down and out to the walls, which makes you feel warm. If you have a conventional fan, toggle the switch on the housing assembly near the pull string or cord to the reverse mode. If you have a remote-controlled fan, find the reverse button on your remote and switch the fan blade direction. If you still have an old, manual thermostat, upgrading to a smart/programmable thermostat is a great way to save on your heating and cooling costs. In fact, according to Energy.gov, when they’re used correctly, smart/programmable thermostats can save you up to $180 per year. Well, these thermostats allow you to set a customized heating/cooling schedule, which means you can program your thermostat to adjust the temperature while you’re away at work/school. This prevents your HVAC system from heating/cooling your home when no one is there, which will lower your monthly energy bills. Interested in a smart/programmable thermostat?